Before I get too far into this whole blogging thing, I want to give credit where credit is due. In the not too distant future, I’ll likely be the world’s hottest blogger in the experimental artisan jam scene. And before my head swells with pride, I want to come clean about who does most of the heavy lifting around here. 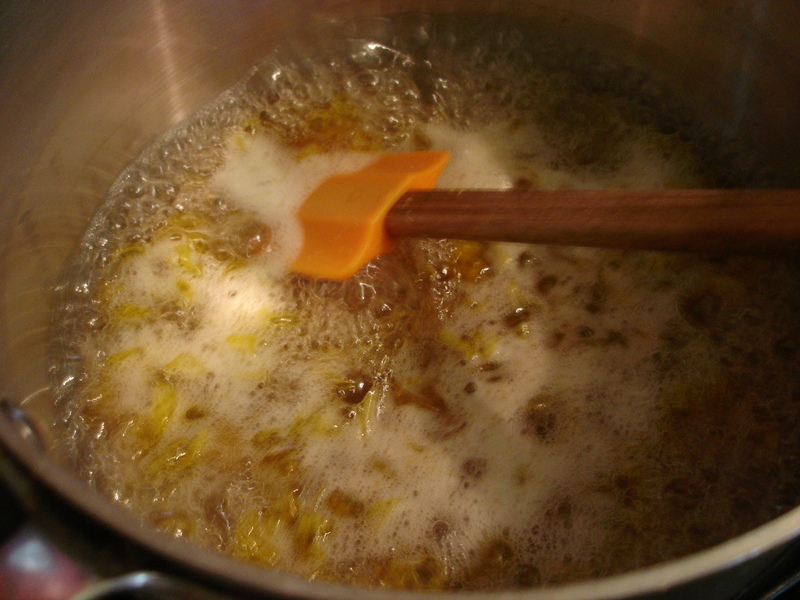 Without pectin, this blog would be a tour of the world’s worst soups. 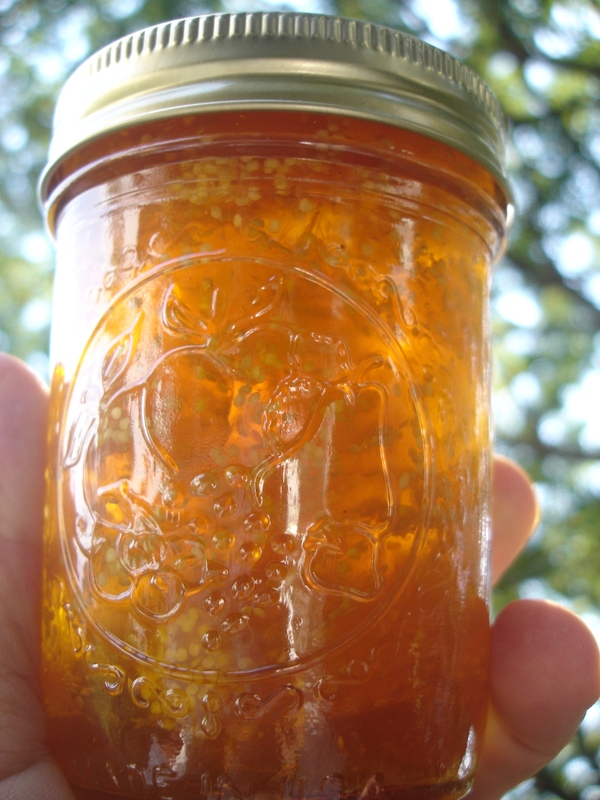 Pectin is the veal stock of making jams, with the added advantage of not having to boil babies to make it. So, what is this marvelous pectin? Well, I’ll tell you. Pectin is a complex carbohydrate found in plant cell walls that helps to bind the cells together. All higher-order, terrestrial plants have some pectin, but pectin levels vary depending on the plant, the part of the plant and the time of year. For example, unripe fruits have more pectin than ripe fruits and hard tissues have more than soft tissues. In fact, one of the reasons ripe fruit is softer than unripe fruit is because of enzymes produced during ripening that break down pectin in the cell walls, thus softening the fruit’s flesh. 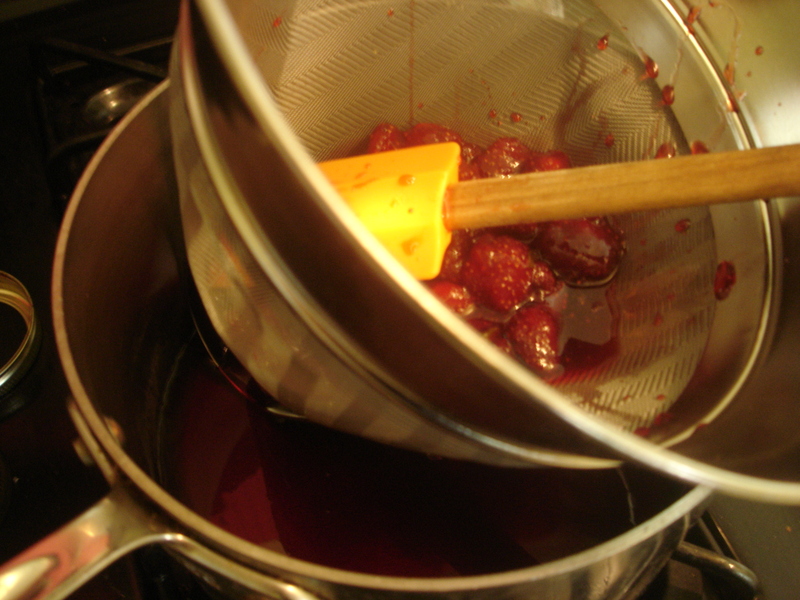 Pectin is important to jam making because of it’s very useful gelling properties. When exposed to the proper ratio of water, sugar and acid, pectin forms a very uniform, consistent gel. And what would jelly be without a good gel? I won’t bore you with all the details, but basically, when you boil the fruit for a jam, the pectin comes out of the cell walls into the acidic syrup (a pH between 2.8 and 3.5 and a sugar concentration of 65% is ideal) and once enough water cooks off, it forms a gel, capturing the remaining water and allowing the jam to sep up. If too much water remains, the pectin molecules won’t come together in a high enough concentration to form the chains needed to create a good gel (you need about .5 to 1.0% concentration). And that’s when you get a poorly set up jam. If you want to know what that looks like, take a look here. There are many brands of commercial pectin available to the home cook, but they are all basically made the same way. The peels, cores and remnants left over after the production of apple or citrus juice (all of which are high pectin fruits) are dried and ground and have their pectin extracted in the form of a syrup. This syrup is vacuum dehydrated and the leftover powder is reground, sifted and packaged. A home cook will then add this pectin powder to a jam they are preparing to increase gellation and shorten cooking times. 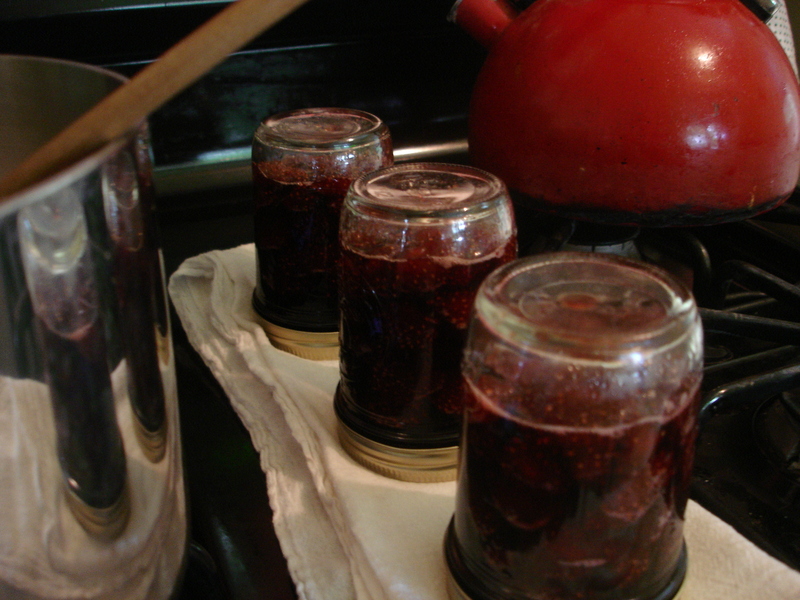 Commercial pectin is a convenient, predictable way to make jams at home. But, not all of us making delicious jams use commercial pectin. Instead, we rely on the pectin that naturally exists in fruits to create a good gel. It takes a bit more work and a bit more thought and planning, but I think it’s worth it. I put a lot of time, thought and energy into making the best jams I can and I don’t want a heavily processed food byproduct in there. So, the question becomes, what do I do if I need to increase the gel of a jam I want to make. What if I want to make cherry or pear jam, fruits with very low pectin levels? The answer comes in the form of Green Apple Jelly or what I’ve been calling Pectin Stock. Right now is a perfect time to make it because we’re just at the start of our apple season and, so, many of the apples available right now are very high in pectin. All one needs to do is add a bit of this jelly to a low pectin jam in place of some of the sugar and let it work its gelling magic. I’m going to do a post on making the jelly in a few days, but the important thing for this post is that I now have several quarts of Pectin Stock that I can use whenever I’m making a jam that requires a pectin boost. And because I made it myself, I know who grew the apples (Bob Ela), when they were cooked (Monday) and what all went into my pectin (not much). And that, my friends, is the sort of thing that makes me happy. Feeling bolstered by my success with the strawberry jam repair, but mostly because I can’t stick to recipes for very long, I decided to freestyle my next jam. I had bought a bunch of ground cherries at the market from a very friendly young farmer whose name I don’t know without any real idea of what I was going to do with them. 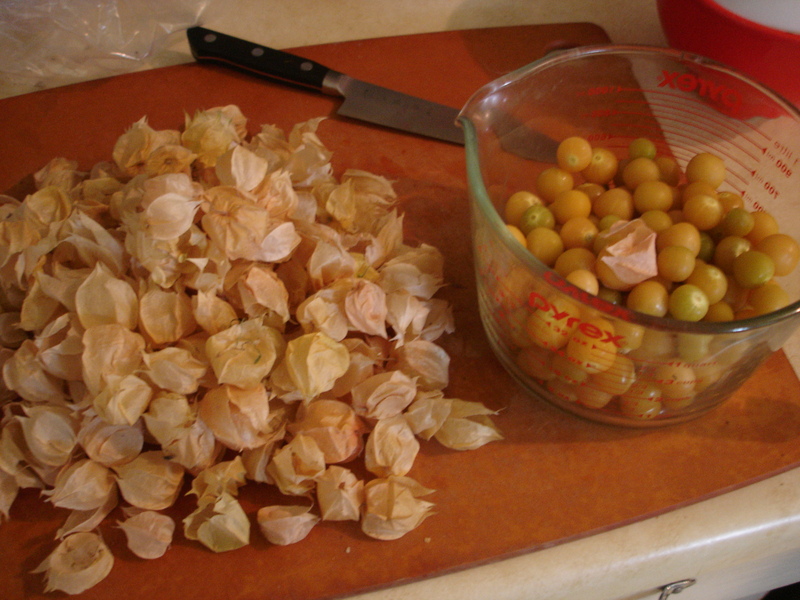 And because ground cherries don’t really grow in Alsace, where Ms. Ferber lives and works, she wasn’t much help. 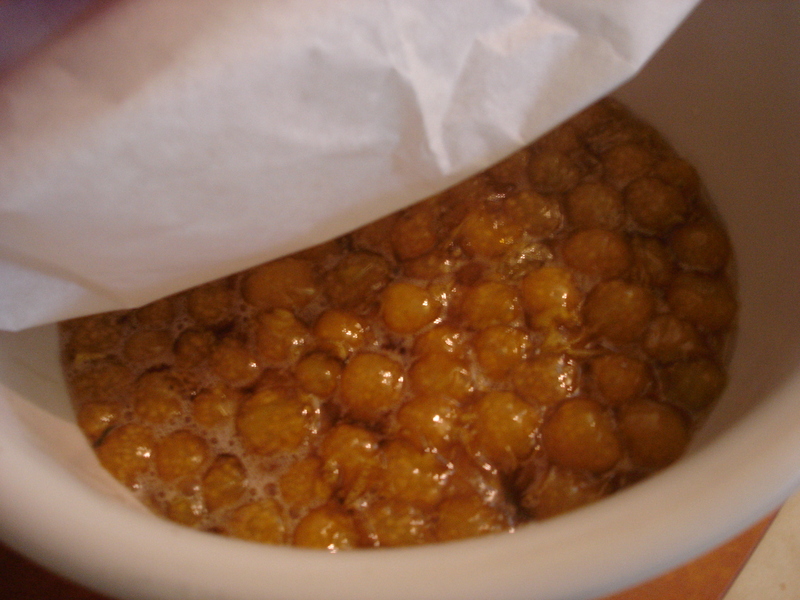 Ground cherries (also called Cape gooseberries) are unique because, while they are eaten and used like other fruits, in addition to being sweet and tart they also contain umami. Umami is the “new” flavor “discovered” in Japan and is often described as meaty, brothy or just plain “deliciousness.” In fact, when I gave Clare a ground cherry to taste, she said, “It tastes like meat.” This is not entirely surprising because ground cherries are closely related to tomatoes and tomatillos, both of which are rich in glutamic acid, the source of umami. Ok, enough theory, back to the jam. Once I’d decided on the components, it was fairly easy to put together a recipe. I started with a basic ground cherry preserve that I found here and pulled out a technique for adding chamomile from Ferber that she uses in a Mirabelle Plum and Chamomile Jam. I worked the two together and off I went. First, I husked the cherries and washed them. Then, I made a syrup with sugar, some water and lemon juice. I added the husked berries, brought them to a boil and simmered for five minutes. The cherries burst, one by one, and turned a beautiful translucent, releasing their seeds into the syrup. I put the cherries into a ceramic bowl and stored them overnight in the fridge with a parchment lid. The following day, I returned the mixture to a boil, while preparing an infusion of chamomile. Once the tisane was properly steeped, I added it to the boiling jam and kept the whole thing at a simmer until reduced to a proper consistency. Interestingly, the jam had turned a brighter yellow overnight, as you can see in this picture. The result is a delicious jam that tastes two parts ground cherry, one part honey, one part chamomile and a pinch of lemon. I gave some to Clare to taste and she said, “That’s really good. I was trying to have an open mind and I didn’t even need it!” I’m pretty sure that’s a compliment. I’m not sure what’s going to come next, but I’ll keep you posted. Combine sugar, water and lemon juice and bring to a boil. 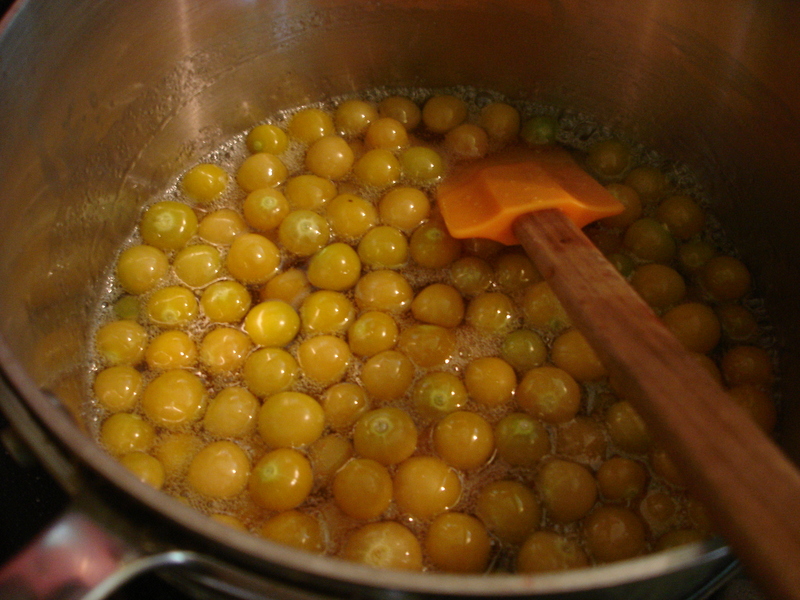 Add ground cherries and simmer for 5 minutes, until most cherries are burst open. Transfer to ceramic bowl and cover with a parchment lid. Refrigerate overnight. Transfer back to preserving pot and return to a boil. Add chamomile infusion, simmer until proper consistency and can. My first project has been a recipe straight from Christine Ferber’s “Mes Confitures,” Strawberry with Fresh Mint and Black Pepper. And while Strawberry and Black Pepper is likely on its way toward cliche-dom, I thought I’d give it a go. Strawberries are ripe and in season and I have ready access to fresh mint in my kitchen. Also, it’s a pretty straight forward recipe that I have all the equipment for. The jam, while being easy, is not quick. In fact, it’s taken me a week to get the jams right. I picked up three pints of strawberries from the farmer’s market last Tuesday night, hulled and cleaned them when I got home and started them macerating with sugar and lemon juice overnight. Ferber is insistant on using a ceramic bowl and a parchment paper lid (she’s insistant about a lot of things) and I followed her orders like a good little cook. The next day, I poured the mixture into a large pot, brought it to a boil, simmered for five minutes (skimming all the while) and returned it to the ceramic bowl to chill overnight. This step half-cooks the berries and dissolves all the sugar crystals into the strawberry juice drawn out during maceration. It makes a gorgeous, crystal clear, ruby red syrup and the berries are just tender. On the third, and what should have been final, day, I strained the mixture through a chinois into another pot. I chose a smaller pot this time, reasoning that it wasn’t necessary to use the large one, as I was straining out the berries. Bad idea. Because the pot was taller than it was wide, it was very difficult to keep the syrup from boiling over while reducing it to the proper consistency. The end result was that it ended up not getting reduced enough, but more on that in a minute. One I had finished reducing it, I added back the berries and added the fresh mint and black pepper, returned it all to a boil for five minutes and canned it, thinking I was done. Well, the problem was that it didn’t set up. Watch this video to see what I mean. Who wants strawberry soup on their bread? Not me. So, back to the drawing board. 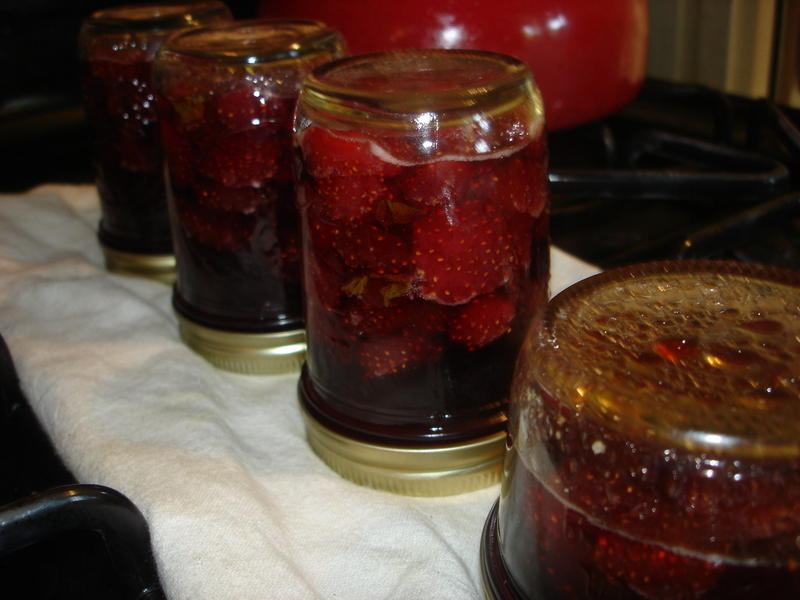 I thought about what to do and decided to just open the jars again, strain out the berries and keep reducing the syrup. I called my personal pastry consultant, Anna, and she thought it was a good idea too. Reduced the syrup and recanned. I’m confident it’s going to work this time because there’s a lot less water in the syrup. Look at the jars cooling from the first attempt (top) versus the second (bottom) and how much water has condensed in the first picture and how there’s none in the second. Water = not setting up. You can also see that the fourth jar is gone. That’s how much water cooked off. So, that’s the first attempt. I just need to distribute them now and see how people like them! Up next, Ground Cherry Chamomile Jam. Well, I made a blog. I don’t like that word very much, blog, but, I did it anyway. I mostly plan to use it to keep track of my various food projects with posts, pictures and videos. But, I also want to have a place where people can give feedback as well. The idea came as I started to teach myself the fine art of jam and jelly making. I want to make jams, can them and then give them to friends to try. All I ask in return is that they eat it and write a comment on the blog telling me what they thought. That way, I can be constantly tweaking my recipes and techniques so I’ll be all ready to sell these wonderful food items to people when Anna and I open our place. Chances are I’ll put other stuff up as well as it strikes my fancy. We’ll see.